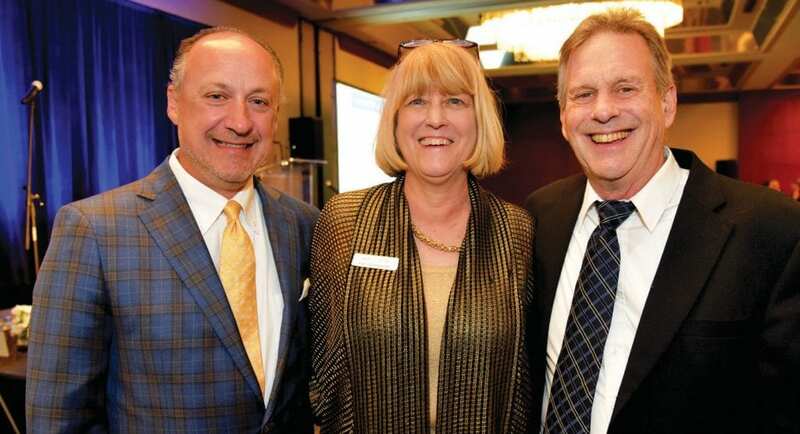 David Paddison (left), two-term past president of Union Mission and honorary chair of the 3rd Annual Raising Hope, joined Pat Youngquist (center), executive director, and her husband, Linden (right) to celebrate the community’s generous outpouring of support for the 81-year-old organization’s work to end homelessness. Union Mission announced this week that Raising Hope, the organization’s largest fundraising event of the year, raised more than $220,000 on May 9th, an increase of more than 40% over last year. David Paddison, former Union Mission board chair and president of Sterling Seacrest Partners, was also recognized at the event for his continued dedication and service to the organization. The event, presented by Georgia Ports Authority, was emceed by Rabbi Robert Haas, leader of Congregation Mickve Israel and featured a video highlighting the life-changing impact Union Mission has had on two previous homeless members of our community. Raising Hope is a significant source for the over $700,000 raised annually within the community to support the local, state and federal programs administered by Union Mission. The organization provided over 90,800 nights of shelter and 72,603 meals in 2017. For more information on how to support Union Mission, contact Pat Youngquist, executive director, at pyoungquist@unionmission.org or (912) 238-2777. To learn more, visit www.unionmission.org.